Shortly after making a public radio apology to the superhumanly powerful man that just tried to have her killed, Trish Walker delivers a line that concisely summarizes one of the major themes of Jessica Jones: “Men and power, it’s seriously a disease.” The show is one long exploration of how a white man with power is able to destroy the lives of others with no repercussions, and Kilgrave is a disease that spreads because he exists in a climate that fosters his growth. In “AKA 99 Friends,” we begin to learn the scale of the Kilgrave infection as his victims begin filling Jeri Hogarth’s office, and while there are plenty of people taking advantage of Hell’s Kitchen’s hottest new alibi, there are a handful whose lives have been genuinely contaminated by contact with Kilgrave. The nature of the trauma varies for each Kilgrave victim, and it shouldn’t come as much of a surprise that the rich white guy suffers the least. One woman housed Kilgrave for two days and was forced to play cello for him until she made a mistake. A black man was compelled to leave his son on the street when he was made Kilgrave’s chauffeur, an act that destroyed his marriage after he was charged with child abandonment. The white guy lost his jacket, and yeah, he knows that it’s not as bad as murdering his parents like Hope Schlottman, but the jacket was Zegna. It’s one of the show’s subtler attacks on white male entitlement, and it’s telling that the man’s expensive clothing (and the status it implies) garners less severe treatment from Kilgrave. The quickest way to incite action in the United States is to cause trouble for wealthy white men, so Kilgrave largely sticks to women and minorities to do his bidding, like the 8-year-old black girl that he uses to deliver a message to Jessica in this episode. The Kilgrave support group serves multiple functions, helping Jessica piece together her archnemesis’ recent actions while also showing her reluctance to work through her past trauma with the support of other victims. Her trauma motivates her to keep hunting Kilgrave, and she doesn’t want to do anything that might quell her desire for vengeance. She’s on a mission, and the support group is a tool to help her track Kilgrave, not a way for her to unpack her emotional baggage. The support group strategy pays off in a big way at the end of the episode when Jessica learns details about the person that has been delivering pictures of her to Kilgrave every day at 10 A.M., and when she revisits the police surveillance video stolen for her by Officer Simpson, Jessica discovers that her junkie neighbor Malcolm is another pawn in Kilgrave’s torturous game. 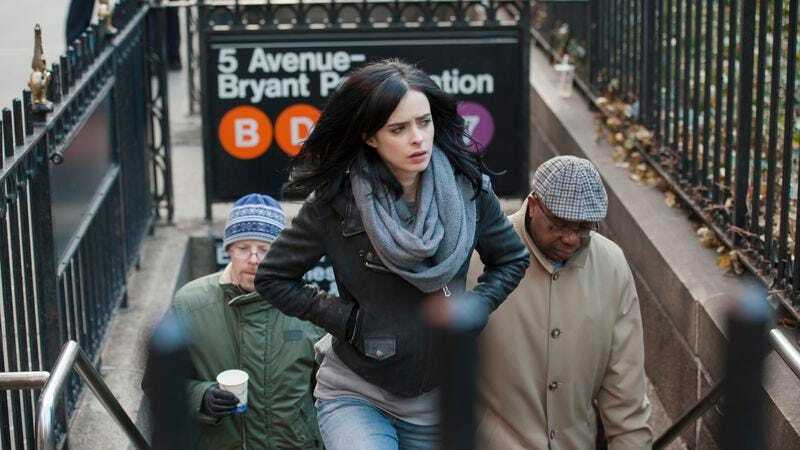 In an excellent Hitfix piece defending the dying art of the episode in a TV drama landscape dominated by serialization, Alan Sepinwall uses Jessica Jones as a specific example of a series that would significantly benefit from having more self-contained episodes to fill out the narrative. One of the big faults of this season is that it sidelines Jessica’s job as a private investigator to focus on her relationship with Kilgrave, and while that choice gives the show a strong central conflict, it doesn’t take full advantage of the storytelling possibilities introduced by the character’s occupation. Jessica Jones shares a lot of similarities with Veronica Mars, but the first season of Veronica Mars devotes much more time to individual cases as it moves the overarching narrative forward. This make Veronica Mars more of a private eye procedural than Jessica Jones, and embracing Jessica’s profession could make for a richer season 2 (assuming it happens, which I expect it will). The Alias comic had Jessica Jones working cases for nearly two years before Kilgrave entered the picture, with writer Brian Michael Bendis drawing inspiration from different corners of the Marvel Universe to tell superhero-adjacent crime stories involving ordinary people living in a fantastic world. That’s what “AKA 99 Friends” offers with the case of Audrey Eastman, a woman who seemingly hires Jessica to take pictures of her cheating husband, but has much more nefarious plans for the superpowered freelancer. Audrey lost her mother in the attack on New York City depicted in The Avengers, and she holds all “gifted” people accountable for the destruction of the building that crushed her mother. Audrey is fueled by grief and rage, but also prejudice, as revealed by her insistence that “gifted” people should be called “freaks,” just as “special” people should be called “retarded.” With her red, white, and blue costuming, Audrey has an implicit connection to the United States, and it’s easy to interpret her plot as a commentary on the ways the American people misdirect their anger when tragedy strikes. Holding all superpowered people accountable for The Avengers’ actions is like holding all Muslims accountable for the devastation on September 11th, or using the recent Paris attacks to paint a negative picture of all Syrian refugees. When you throw a gun in a bigot’s hand, it becomes very easy to act on those prejudices with lethal intent, as Audrey and her husband plan to do with Jessica in this episode. Having learned about her abilities from the wife of Gregory Spheeris (the man served a court summons in the first episode after Jessica picked up his car), the couple lures Jessica to a dilapidated building for her murder, but things quickly go south for the Eastmans when Jessica unleashes her power. The actual execution of Jessica’s berserker rage isn’t as effective as it could be; the dialogue from Hilly Hicks, Jr. becomes more heavy-handed, and Ritter struggles to make it sound natural as she berates the Eastmans while destroying the room with her bare hands. The resolution may be a bit awkward, but the build-up works well, creating a lot of tension for the episode as Jessica tries to figure out if Audrey has connections to Kilgrave. It’s also interesting to see the show explore the personal fallout of cataclysmic superhero activity, finally giving Jessica a case with ties to the fantastic world from which she tries to keep away. The other major female players in the cast get considerable attention in “AKA 99 Friends.” Jeri’s divorce plot is becoming a bigger issue, and the scene where Jeri and Pam run into Wendy outside of the restaurant where Jeri proposed to her brings a lot of dimension to the personal dynamic between the three women. With only about a minute of screen time, Robin Weigert does exceptional work capturing the pain Wendy feels over this situation, and that emotional turmoil has an influence on Pam, who ultimately sides with Wendy and decides that the restaurant is off-limits. We also see the start of Jeri’s fascination with Kilgrave, and she’s disgusted that he uses his power to gain the company of pretty women and expensive things when he could change so much with his ability. Jessica is rightfully furious when she hears Jeri talk about bringing Kilgrave over to their side, making it clear that Jeri doesn’t fully comprehend the horror of Kilgrave’s actions. This episode provides more details about Trish’s past as a child star, revealing that she had a TV show (It’s Patsy!) and a toy line created by her stage mother, who blew a jury to win her daughter a Teen Choice Award. These details flesh out her character, but the majority of the Trish content in this episode involves the start of her relationship with Will Simpson, who goes out of his way to make Trish feel safe. After being introduced as a mind-controlled assassin last episode, Simpson returns as a white knight in “AKA 99 Friends,” forcing his way into Jessica and Trish’s fight against Kilgrave to make amends for his past behavior. Like Jessica, Simpson is deeply paranoid after his experience with Kilgrave, but his reaction to this feeling is much more aggressive than Jessica’s. He violently grabs Malcolm when he thinks the junkie is spying on his conversation with Jessica, and even though later events reveal that Simpson has a legitimate reason to be suspicious of Malcolm, his edgy, anxious disposition could easily become dangerous if he’s pushed too far. Simpson’s first big act of interference is getting Trish a gun, which is such a typical male solution to her problem, and from the very outset, the script hints that Simpson’s assistance isn’t going to be as helpful as he thinks. After he recounts a childhood memory to Trish of all his G.I. Joe’s burning up when he set his sister’s Barbie Dream House on fire, Simpson clarifies the intent behind the tale: “That was meant to be a story about how I’ve always been the guy saving people.” Trish is quick to point out that they were plastic and they all melted, suggesting that Simpson has a history of making problems worse when he swoops in to save others. The man thinks he knows what’s best to help the women in distress, and that will eventually become a liability when Simpson’s plans get in Jessica’s way. One of Kilgrave’s victims wasn’t allowed to stop smiling during the entirety of her time under his control. Gillian Glasco’s performance really sells Emma’s fear as she recalls her trauma, continuing to make “smile” one of Kilgrave’s most chilling demands. There’s some very smart use of humor in the Kilgrave victim interviews montage, with the more comedic, fabricated stories creating a strong point of contrast for the people who are legitimately impacted by Kilgrave’s actions. Could Trish’s apology be any more forced? If I was a “TrishTalk” listener, I’d be so confused by her sudden change of attitude. Jessica says she had good intentions for spying on Luke, but they’re still a mystery at this point. I love the scene where Jessica watches Audrey by propping herself up between two buildings. Superhuman leg strength for the win! “Sorry, we had our headphones in. I’m helping Trish make a party mix.” Could the headphones line be a reference to Jessica breaking into the students’ apartment in the first episode and finding them inside with their headphones on? “No Teen Choice Award for you.” That scene with Jessica and Trish walking down the street after Trish’s radio apology is great.